Philips continues to lead the way in home automation with their Hue smart bulbs. After being on the market for two years, they’re now becoming mainstream and widely adopted among consumers. With Apple integrating a HomeKit software platform for developers in iOS 8, users will soon have full control over their home from a mobile device. The Iris was unveiled last summer and is now available through select retailers at $99. I found the Iris by surprise at a local Best Buy store. It had to of come in recently as it’s not listed in their online database yet. 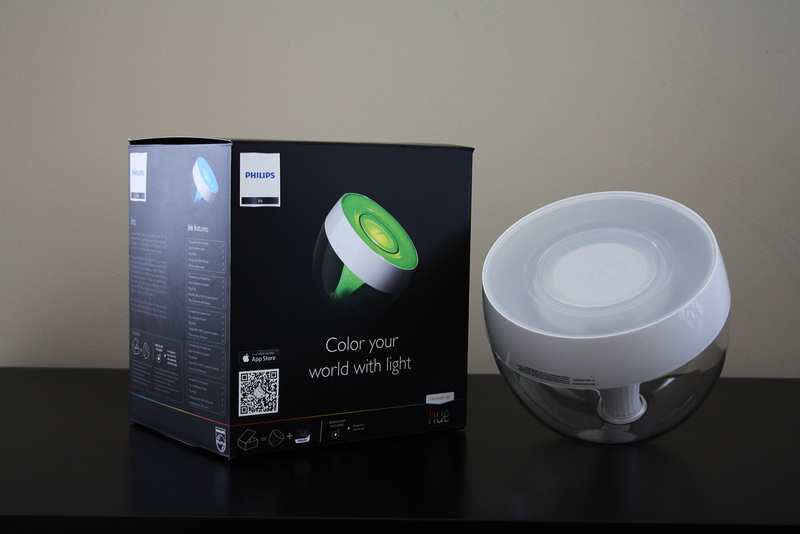 The Iris is packaged similarly to the other Friends of Hue products, only having the light and some literature inside. The first thought I had after removing it from the box was that it’s bigger than I originally thought it would be. The glass encasing at the bottom wraps around to the top where the light emits from. There is a small flat area on the base that allows it to point towards a surface. In most cases it will be facing a wall or corner, but it could also be used in other directions in tandem with notifications from IFTTT. Setting up the Hue Iris couldn’t be easier. It will automatically turn on and flash a few colours when plugged in. Opening the settings section within the Hue app on an iOS or Android device will provide an option labelled as Connect New Lights. It will pair with the Iris and integrate it into the colour mixer. As with all other new lights, previously created Scenes must be edited to include the new addition. If you own a Hue Tap, its presets also need to be adjusted as well. A Hue Bridge is required to pair the Iris with, which can be found inside any of the Starter Kits. The Hue Iris is able to recreate over 16 million colours. This can be done from the Philips Hue app, or with any of the many third party apps currently available. Similar to the Lightstrips and Bloom models, the Iris isn’t able to display white and fluorescent shades like the A19 bulbs can. The Friends of Hue series aren’t meant to be replacements to actual light bulbs, instead used as added splashes of colour to enhance a room. When put up against the Bloom, the Iris is much bigger and emits more light. At 10w and 210 total lumen output compared to the Bloom’s 8W and 120 lumen output, there is a noticeable improvement for the $20 price difference. I will still utilize both Blooms in my setup, but the Iris has become my favourite light in the series. It has a radiant aura that takes over any surface it’s facing. The inner glass casing gently reflects the selected colour, leading to a soothing glow for any atmosphere. Mixing it in with other Hue products to blend multiple light shades together can create the perfect mood to match your personality. 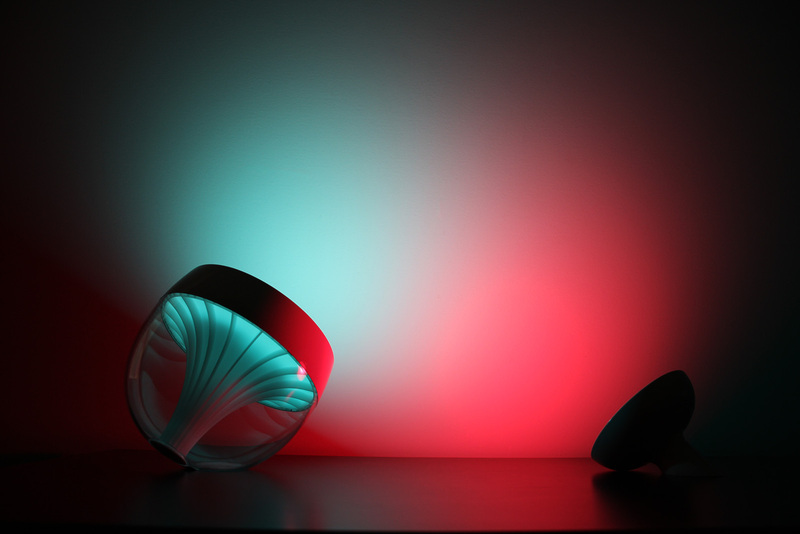 I am impressed with the devotion that Philips has shown in the Hue series, and look forward to seeing what the future brings with personal lightining and home automation. The Philips Hue Iris is slowly becoming available in retail stores around the world. For more information, head over to the official Hue website.